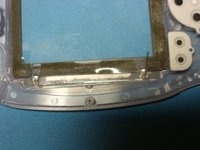 An attempt to add internal lighting to an original Game Boy Advance. Inspired by an article in Make Magazine. 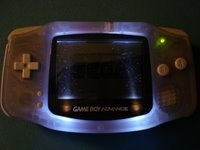 This project was my first attempt to add internal lighting to my GBA. I got a used GBA for only $20 at a local GameStop because I wanted a console that could play both GB and GBA titles (My wife and my 7 year old both have DSes (hey-is that the right way to make DS plural? ), but I'm cheap, so $130 on a toy that I'm not sure I'm going to use much seemed excessive. The used GBA was therefore the perfect thing - cheap, lots of existing games (also cheap) and if something goes wrong - I'm only out $20. The article that inspired this attempt was in the DIY: Gaming column of Volume 06 of Make Magazine, and was written by Dave Prochnow. First I'm going to describe some things that were missing from the article, and then I'll describe my implementation of the idea. 1) Dave gives a source and part number for the LEDs, but didn't provide relevant specifications. Since that vendor no longer has the LED (and doesn't maintain old product pages), I can't figure out exactly what Dave was using. 2) The photos included with the article could have been a bit better in my mind. 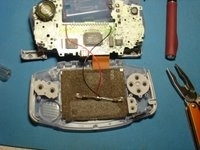 I especially wish there had been an 'in use' photo of the modified GBA. I'd have liked to have an idea of how well lit the screen was with Dave's technique. It also would have given me a leg up on figuring out the LED positioning, as I didn't find Dave's explaination very clear. 3) I'd have liked Dave to specify what, exactly, I was soldering to on the GBA board. Obviously the GND pin was ground, but what was the S2 pin? I took a meter to it and found it to be +5, but it would have been a nice touch for Dave to include that information. The only real limitations are that it has to fit completely inside the GBA case, and that it's going to drain the GBA batteries faster with the light, than without. This is natural, and I consider it a worthwhile trade off. My LEDs came from BG Micro, LED1155 High Bright White 3mm. Specs:5000mcd typical. 3.5Vdc/30mA, 20 degree. Resistors were 67 ohm, 1/4 watt. I used the LED calculator here to make my computations. Given my LEDs, it came up with 56 ohms. The closest I had to that in my box were 67 ohm, so that's what I used. I used wire scavenged from some old phone cord, because that's what was handy in black and red. To get power we'll be wiring to GND and S2 around the cartridge connector. S2 is a +5 power supply that is active whenever the gameboy is turned on. The LEDs are backed as far out as they will go (to avoid hitting the LCD and board) and are out pretty far to the left and right. The left/right positioning is determined by finding two little support nubs (under the rubber gasket) and having the LEDs be just inside them. To get the LEDs to sit there, I bent the legs at right angles to the body. 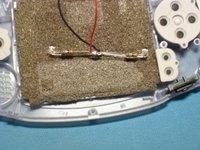 On both LEDs, I bent the cathode (-) leads of the LEDs such that they lay along the case and went toward each other. 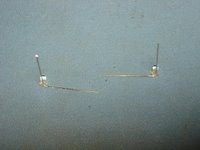 I then bent the anode (+) leads so that they stuck straight up. I then soldered the two cathode (-) leads of the LEDs directly to each other (with a black wire leading off) to connect them. Basically, a rectangle with the two LEDs at either end, and resistors/leads connecting them. Now all that's left is to connect the red and black wires, and put it all in place. I also cover the resistor leads with electrical tape so that I don't have to worry about downward pressure causing a +5/GND short. A dab of hot-melt glue behind each LED holds them in place during assembly. Red wire goes to S2, black wire to GND. (NOTE: I built this up having soldered the wires to S2 and GND before assembling the LEDs & resistors. That was harder than necessary. Build the LED module, then attach the wires to S2 and GND after it's in place). Close it up and try it out. Care must of course be taken when putting the display back on and dressing the wires under the battery holder and circuit board. 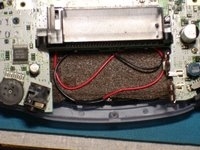 You don't want to break anything or pull any wires loose, and it's important that nothing interfere with the buttons. When I was finished, the GBA did in fact work! The problem is, the LEDs didn't provide nearly enough light for the job at hand. That picture shows my GBA with Super Monkey Ball Jr. in it, just booting up. The screen is white, with a blue SEGA logo. As you can see the LEDs are quite brite, but the light isn't going onto the LCD where it's needed. Instead it's shining up in straight lines, illuminating only part of the display. This picture was taken with no lights directly on the GBA and no flash on the camera. Conclusion: The added LEDs were a flop. They don't illuminate enough of the GBA screen to be worth bothering with. I have removed them to avoid sucking down battery unnecessarily. 1) LEDs. I don't know what LEDs Dave was using. I took a stab at some likely looking LEDs, but I suspect his had a much wider viewing angle. 2) LED positioning. I didn't put my LEDs all the way into the corners. I did what I did in order to make the wiring easier, but I think I partly defeated myself in the process. 3) Resistor value. I used a recommended resistor value for the LEDs I had. I don't know what LEDs Dave had, but they either had significantly different characteristics, or he was running them above their rated current. Put the LEDs all the way at the corners. Use LEDs with a much wider viewing angle (80-90 degress would be optimal). If I could get an LED with 180 degree viewing angle I could try one LED at the center of the display. That's not likely to work as well as two LEDs, however. Use LEDs that are less than 3mm thick so that I can get the LEDs right up against the LCD. This may require use of surface mount LEDs. e-mail webmaster at the obvious with questions/issues.